In the alley beyond Alabama going towards Park Blvd., about midway between Monroe and Meade, I spotted a lanky, grey short-hair sprawled on the pavement; June 13, 2017. She slipped away as my wife and I approached, among cars against a garage, resisting me and the Leica Q. 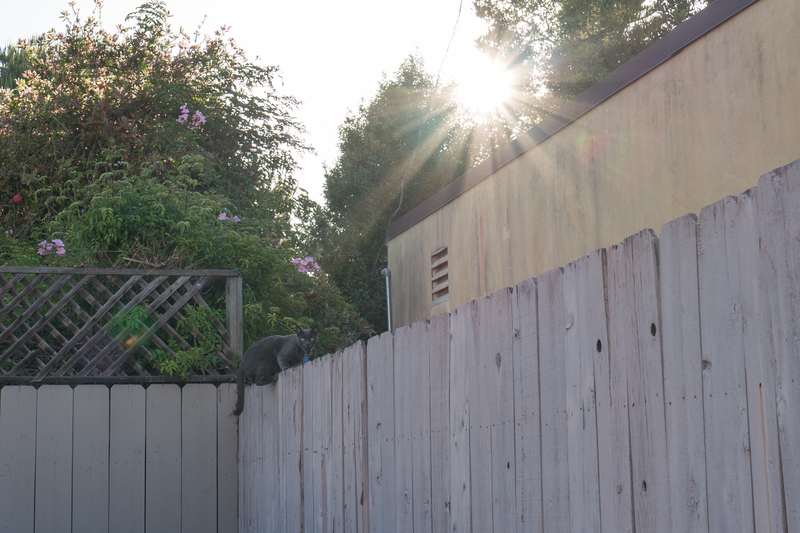 The Featured Image shows her hanging on the fence, at least a six-footer and taller than me, following a dramatic leap. She balanced there long enough for four clicks of the shutter. This is the third shot. Once again, the mirrorless camera’s 28mm, f/1.7 Summilux lens and 24-megapixel full-frame sensor deliver super sharp detail enough for a close-crop. Vitals: f/8, ISO 100, 1/125 sec, 28mm; 6:36 p.m. PDT. The second close-crop is from a moment captured through a crack in the fence. 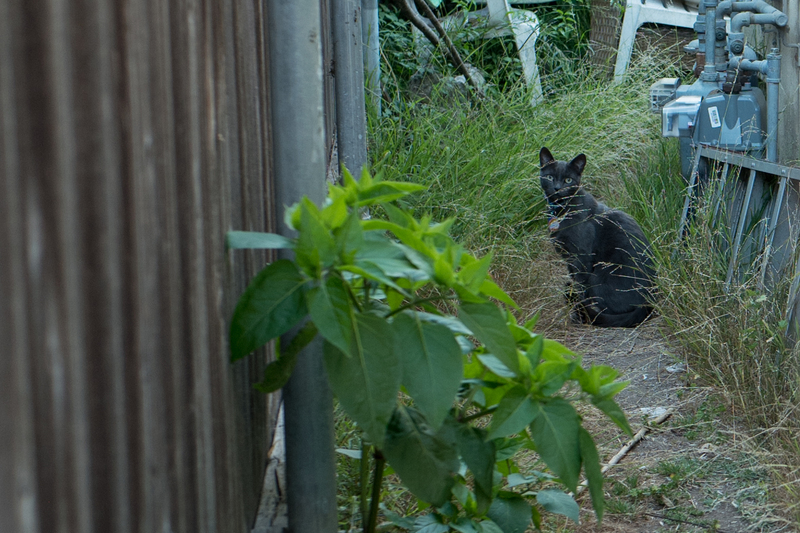 Against the alley’s darker environs, her fur takes on black hues. Vitals are same, except for f/3.2 aperture. I auto-tuned the original DNGs in Adobe Photoshop Lightroom, sacrificing some detail. More featured felines: Scruffy, Roly Poly, Woo, Skull, Biscuit, The Colonel, White, Chipper, Frisky, Stretch, Needy, Farfisa, Mates, Hunter, Pee-Pee, Blue, Blue Too, Bonded Pair, Patience, Fess, Jumper, Frenemy, Looker, Cozy, Scout, Lurks, Skit, Mini, Betty, Black and White, Stalker, Bell, Chill, Sammy, Scratch, Poser, Star, Grey and White, Watcher, Herman, Comet, Roman, Willow, Chub, Nimbus, Watson, Lilo, Kit, Pepe, Twilight, Sebastian, Spot, Booger, Ash, Veruca, Riley, Mellow, Bonde, Flower, Glass, Black, BeBe, Fang, Bruce, Siamese, Pounce, Tortie, Haiku, Fraidy, Peso, Daniel Tiger, Dusk, Stride, and Dainty.